seriously, how are the kids in these books so adorable? This delightful series introduces very young children, in an amusing and friendly way, to situations they might find themselves in for the first time. A different family in each of the books discovers how to deal with these situations and what to expect of them. The colorful illustrations are packed with interesting and informative things for children to look for, talk about and learn about. And the simple vocabulary will enable slightly older children to read the books for themselves. This is a fabulous book for our K1 Unit of Inquiry into transport, and children love choosing it in the library - it's a favourite! It's great for reading at home as it has two stories - a simple version and a more complex version, so you can adapt your reading of it to suit your child's vocabulary. This book is good for traveling, and first tines. Before the holidays, you can read this book and talk to the students about how to be safe and follow rules. 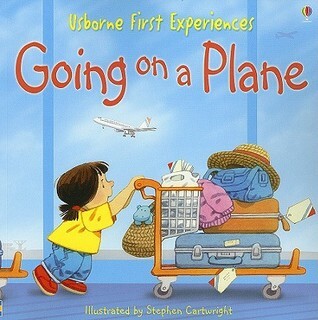 Slightly bland picture book that shows a family's plane trip in detail. There is a meal on board and the family shows their passports to officials, so they are obviously going to another country.